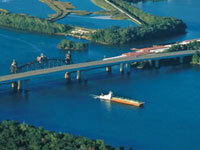 West Tennessee is defined by its rivers including the winding, bucolic Tennessee River to the east and the majestic Mississippi bordering on the west. From the urban energy of Memphis and Jackson to the small farm towns that dot the landscape, you will find soulful music, historical drama and natural wonders. Visit the natural wonders including the Tennessee and Mississippi Rivers and the Tennessee River Freshwater Pearl Farm or Reelfoot Lake and Kentucky Lake in the north or the historical Pinson Mounds in the south central. Relive music history at Graceland, Sun Studio and the Stax Museum of American Soul in Memphis and discover new artists performing every day on Beale Street. Stop in to the Rock-A-Billy Hall of Fame. If you are are a history buff drop by Casey Jones' house and the old railroad station in Jackson. As a Civil War afficionado, you will want to seek out our numerous Civil War grounds, especially including Grant's trail to Shiloh. Don't forget the National Civil Rights Museum offers a glimpse into Tennessee's diverse history.